Note: Additional Trucks, Equipment, Attachments and Services are available. See the "Prices" page for more information. Approximate digging depth on most 410 John Deere Extendahoes is 19ft. 11 inches. Specialty buckets on request. 12", 18" 24", & 36" standard buckets. Approximate digging depth on most 410 John Deere Extendahoes is 19ft. 11 inches. Bobcats can dig about 9’ deep and the 334 Bobcat Mini-Excavator digs about 11’. *Move In Charges applies to all equipment. There is no move out charge. *Rates apply for standard work hours. Overtime hours, weekend work and holidays are billed at higher rates. ** NOTE: Equipment may not be currently configured as shown in these pictures. *All of our equipment is operated and maintained. *We carry one million dollar/2 million aggregate limits on our liability insurance. *All backhoes come with a standard set of buckets: 12”,18”,24” & 36”. You will need to make a special request for buckets other than standard sizes above. 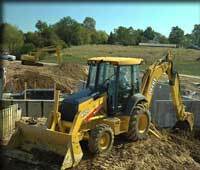 American Bobcat and Backhoe Service, Inc.
...has continued to serve our clients for the past 41 years with first-rate service and state of the art equipment. We are continually upgrading equipment and adding additional services to better serve our customers. We appreciate your continued patronage and welcome any comments or suggestions that you may have!